“Water Champion” Paula Kehoe looks to do for the nation what she did for San Francisco — to greatly expand water reuse opportunities and implementation. 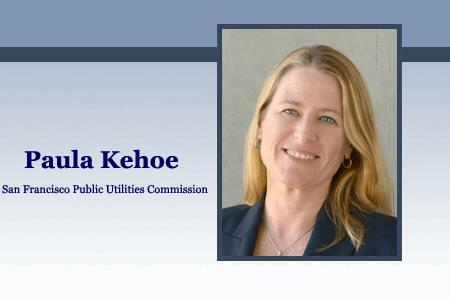 Paula Kehoe is the Director of Water Resources for San Francisco Public Utilities Commission (SFPUC) as well as the Chair of a new National Blue Ribbon Commission launched by the US Water Alliance and the Water Environment & Reuse Foundation. Her expertise lies in water reuse and conservation, having bolstered and secured San Francisco’s supply through programs that promote water recycling, replenish groundwater, and curb water waste. Her success at SFPUC led to her appointment on a special commission put together to spearhead onsite non-potable reuse nationally. Kehoe is at the forefront of a movement that is destined to proliferate, someday becoming the norm. Reuse is essential to keeping up with the supply needs of a growing population; furthermore, it is sound business practice as the cost and risk associated with diminishing resources comes to bear. For water managers, wastewater operations, and businesses alike, the obvious benefits of water reuse would seem to dictate a sooner-rather-than-later approach, but implementation has lagged far behind the technical capability, which has long been established (particularly for non-potable use). In the following Q&A, Kehoe explains both the benefits and the barriers to water reuse, the role she and her colleagues have in fostering widespread implementation, and the keys to assuring sustainability moving forward. You were recently named Chair of the National Blue Ribbon Commission for Onsite Non-potable Water Systems. What are the goals of the commission? As water supplies become more strained, climate uncertainties evolve, and populations grow, communities are looking for new ways to develop and manage local water supplies and increase the resiliency of water infrastructure. Onsite water systems, which collect and treat blackwater, stormwater, and rainwater to reuse for irrigation, toilet flushing, and cooling, is an essential component of a broader strategy to build water-resilient communities. Onsite non-potable water systems are usually integrated into a city’s larger water and wastewater system and contribute to more resilient and sustainable water management by reducing valuable potable water used for non-potable purposes and minimizing strain on wastewater systems. Identify additional research needs in the field. Additionally, The National Blue Ribbon Commission is the culmination of over four years of work led by the SFPUC, with support from several water utilities and public health officials along with the US Water Alliance, Water Environment Research Foundation [now the Water Environment & Reuse Foundation], Water Research Foundation, and WateReuse Research Foundation. How is the commission working to achieve these goals? Protect public health. In order to secure a sustainable water future, we need diverse approaches to water management. In all of the work we do, we are committed to protecting public health and ensuring safe, secure, and reliable water use and reuse. Develop science-based policy. As the commission develops policy recommendations and guidance, it will be driven by risk-based science and research. Utilize a consensus-based approach. If we align our diverse experiences and expertise, we can achieve the best outcomes. The commission will seek consensus across all of the work we do together. Integrate best practices. The work of the commission is informed by the best practices in the management, operations, and oversight of onsite non-potable water systems. Honor local context. The commission sees great value in the development of policy and business models to support the effective adoption of onsite non-potable water systems. At the same time, the commission recognizes and respects that policy and program implementation will vary based on needs and context at the local and state level. Commit to continuous learning. As the adoption of onsite non-potable water systems is evolving, the commission is committed to staying abreast of new science and new approaches. We are inclusive of input from interested stakeholders as we learn together. What are some of the highest-volume non-potable water applications? Is agriculture a suitable and safe use? The urban non-potable applications include: toilet and/or urinal flushing, irrigation, cooling/heating applications, decorative fountains, and process water. Toilet flushing and landscape irrigation are the most common end uses of onsite treated water in San Francisco. On average, implementing on-site non-potable reuse for toilet flushing and irrigation demands can potentially reduce potable water consumption anywhere from 20 to75 percent when compared to a building of similar size and use. Who typically has final say on onsite vs. centralized treatment? How is the municipality involved in decision-making? Currently, there are no overarching national standards for water quality or required treatment for alternate water sources. Existing plumbing codes often include requirements for water quality, construction, and allowed end uses for alternate water sources. Typically, onsite water systems may be incorporated into plumbing permits and often require a special permit to operate from a state or local public health agency (authority having jurisdiction). The additional public health permit is often required as plumbing codes do not cover ongoing operation and maintenance of alternate water source systems to ensure the protection of public health and the public water system post-construction. Building codes, including the plumbing code, are generally enforced at the time of construction and are not intended to mandate ongoing operation and maintenance. In San Francisco, many developers trying to navigate the regulatory pathway were sent to multiple municipal and State departments and were left confused on the next steps. What permits are required, who issues the permits (state, local), and what water quality is required to reuse onsite sources to help new buildings dramatically lower their potable water consumption? The SFPUC saw this as an opportunity and joined together with the city’s Departments of Public Health, Building Inspection, and Public Works to develop a streamlined local regulatory pathway to permit onsite non-potable water systems and provide for ongoing monitoring and reporting to protect both public health and the public water system. Our Non-potable Water Program allows for the collection, treatment, and reuse of rainwater, stormwater, graywater, and blackwater at a building- or district-scale. The program establishes a process for permitting the full spectrum of decentralized water systems, provides developers with tools for estimating a building’s demand and potential onsite supplies, and incorporates a grant program. San Francisco’s Non-potable Water Program may be one of the nation’s most cutting-edge onsite water reuse programs. The development and implementation of local oversight and management programs in other areas have been constrained due to a lack of guidance at the state and federal level. That’s where the work of the Blue Ribbon Commission comes in: as we build upon our research to develop model state and federal guidance and policy, the frameworks will in turn support local communities to adopt programs to manage and oversee onsite non-potable water systems. What are the financial and operational implications for choosing onsite treatment and reuse? The financial and operational considerations for onsite non-potable water systems can be broken down into the costs associated with the treatment system and the costs associated with ongoing operations and maintenance. Graywater treatment system costs can range from $250,000 for a 1,200 GPD system to $500,000 for a 5,000 GPD system. Blackwater treatment system costs can range from $400,000 for a 5,000 GPD system to $2.3 million for a 50,000 GPD system. These cost estimates do not include plumbing costs associated with the installation of dual-plumbing. Typical operations costs includes the costs for water quality monitoring of parameters such as total coliform, pH, turbidity, and chlorine residual. Annual costs for water quality testing can range from $1,120 for a graywater reuse system to $13,950 for a blackwater reuse system. In San Francisco, we plan to shift the way we approach treating water by requiring specified treatment technologies that are operated within defined limits coupled with appropriate control points to demonstrate proper performance of the technology. We are responding to new public health guidelines that the SFPUC, National Water Research Institute, Water Research Foundation, and Water Environment & Research Foundation published in March 2017. This new approach may minimize some of the ongoing monitoring costs (replaced with online monitoring), but may increase the one-time capital cost of treatment systems installed in San Francisco. Are the considerations different for new construction vs. existing facilities already tied into a city's larger water and wastewater system? What compels existing facilities to convert? Many developers and designers are incorporating innovate onsite water systems into new building. Green building programs, like the LEED® rating system and Living Building Challenge™, often encourage onsite water treatment systems as a sustainable water management tool. In San Francisco, almost all of the buildings with onsite non-potable water systems are incorporated in new construction. Retrofitting an existing building can be cost-prohibitive. However, a building in San Francisco was recently remodeled by incorporating an onsite non-potable water system to earn LEED Platinum certification. In San Francisco, onsite non-potable water treatment systems are required to be connected to the city’s water and wastewater systems. These onsite systems can’t provide for 100 percent of the building’s potable water needs. Systems need to be taken offline periodically for routine maintenance, so it’s critical to have the systems connected to the water system. Additionally, systems need to have a built-in bypass or overflow function to direct water to the sewer system in case it is not needed or does not meet our water quality standards. As Director of Water Resources for SFPUC, you're tasked with protecting and stretching San Francisco’s water supply. How has that mission evolved, and what are the key programs employed? Creating a water-efficient San Francisco by promoting efficiency and reducing wasteful consumption in homes and businesses through our Water Conservation Program. Irrigating San Francisco’s large parks and golf courses by treating water through our Recycled Water Program. Reusing water in buildings by collecting and treating water within buildings for toilet flushing instead of drinking water through our Non-potable Water Program. Maximizing local water sources by blending groundwater with surface water supplies through our Groundwater Program. Encouraging homeowners to irrigate their landscape by collecting and using rainwater and graywater through our Residential Programs. Our mission has recently evolved with OneWaterSF. We are committed to a new approach to water and energy resource management. We are moving away from operating within traditional water, wastewater, and energy boundaries to developing projects and programs that consider the impact of one resource on another and taking a holistic view to optimize resources and maximize benefits across the organization. In recent years, we have been realizing the benefits of projects that synthesize multiple resources. For example, the constructed wetland and rainwater harvesting systems at the SFPUC headquarters building have enabled us to reuse wastewater and stormwater for non-potable uses inside and outside the building. This saves significant potable water, reduces stress on the wastewater system during heavy rains, and serves as a model for decentralized reuse throughout San Francisco. While the benefits of such projects and programs became evident, it was in 2016 that we began to formalize the thought process to seek out such synergies with the introduction of OneWaterSF. How big a role does conservation play? San Francisco has long known that water resiliency starts with efficient water use. For over 25 years we have been promoting water conservation. Today, our residents are using approximately 41 gallons per person per day, about half the average use in California. The low water use number is the result of a commitment by our customers and decades of investments into education and conservation policies and programs. Installing onsite water systems can further reduce the water footprint, match the right water for the right end use, and utilize local water resources such as rainwater, graywater, and blackwater. What are your thoughts on smart water programs, including advanced metering infrastructure, to engage customers, detect leaks, etc.? New automated water meters are now in place for more than 96 percent of San Francisco’s 178,000 water accounts. The new technology transmits hourly water consumption data to our billing system by wireless network, and we are the first major water utility in California to fully deploy it. This reliable and frequent water usage information allows you to monitor use and detect leaks faster than possible with the existing bi-monthly manually-read meters. We have created a web portal, My Account, to enable our account holders to see daily water usage data and learn ways to conserve. Frequent transmission of more precise water consumption data, allowing for quicker and more precise identification of high usage and suspected leaks. Additionally, we developed a leak detection notification program for our customers. Call resolution improvement. Customer service representatives will have access to more frequent and accurate water consumption data, as do customers using our My Account portal to view daily water use. Improved meter reading ability, with virtual elimination of any bill estimations. Ultimately, what are the biggest obstacles to sustainability, and what needs to be done to overcome them? We need to encourage new ways of thinking and create innovative approaches to provide better water resiliency. Fostering innovation takes work and requires all of us to recognize that we have many solutions to our water challenges. At the same time, we often overlook the need to need to honor local context and adapt our water management strategies to our communities. More times than not, we try to find the “one size fits all approach”, but rather it’s OneWater, not OneSize. Similar to how we are now thinking about buildings as water resources, we are in need of a cultural shift that places a similar value on other types of resources such as biosolids, wastewater, and biogas to encourage cost-effective and energy-efficient resource recovery facilities of various sizes and scales. San Francisco is a leader, but are others following? Do you see or predict more commitment to and investment in sustainability? To what scale? This paradigm shift with the focus on collecting and treating various sources of water onsite for non-potable uses is not just a San Francisco trend. The number of communities across North America eager and interested in integrating onsite non-potable water systems to develop local water supplies and increase the resiliency of water infrastructure is increasing. As our urban water infrastructure evolves to respond to our water challenges, so too will our institutions responsible for managing these systems evolve.